Most drivers have experienced that sense of panic from almost swerving into another car that just wasn’t visible. Mazda Blind Spot and Cross Traffic Monitoring avoids this by alerting the driver when another vehicle enters its blind spot. Mazda Blind Spot Monitoring (BSM) system utilizes real radar to monitor areas ON BOTH SIDES of the vehicle to the rear at speeds above 20 mph. The BSM system notifies the driver of vehicles in the detection areas by illuminating the BSM warning light located in the mirror. If the turn signal is operated in the direction the BSM warning light is illuminated, the warning light will flash and the system will also warn the driver of the vehicle in the detection area with a chime sound. That chime volume is adjustable through the Mazda Connect System. BSM Operation Conditions – Ignition is ON. – Your vehicle speed is approximately 20 mph or greater. – System is not deactivated. (“BSM OFF” lamp is not illuminated). * When ignition is on (default), BSM automatically turns on – Shift position is other than reverse position. * If shift position is in reverse position, the Rear Cross-traffic System is activated. 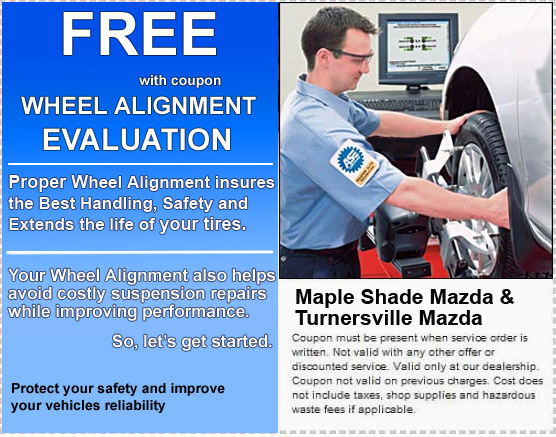 At Maple Shade and Turnersville Mazda we know that proper 4 wheel alignment is key in maintaining the handling and performance your vehicle was designed with. Save on Gas– When your wheels are out of alignment there is added resistance to forward movement and momentum. Your engine has to work much harder and in turn burn more gasoline reducing your MPG. Save on New Tires – With wheels out of alignment your tires wear quicker and usually unevenly considerably shortening there life span. The faster your tires wear out, the faster you’ll need to purchase replacements. Those extra tires are not cheap and will come out of your pocket. Reduce Wear and Tear to your Vehicles Life– Your vehicle tires, wheels, brakes, suspension and steering are all interconnected mechanics. With your wheel alignment out of whack you place additional stress and wear on the entire vehicle. This increases the likelihood of a failure or reduced lifespan and performance of all off these systems. Save the Environment – A properly aligned vehicle uses less gasoline, fewer tires and more likely to need fewer repairs. That’s a win-win-win for you and the environment. Save Your Life –Improper alignment can lead to dangerous situations. A unevenly worn tire can lead to a blowout and in a emergency response situation you want your vehicle to be able to handle and react at peak performance to avoid damage to your vehicle, yourself and others. So there are many more benefits to an alignment than making sure your car drives in a straight line. If you have recently hit a large pothole or curb, if your cars pulls to one side, if you feel strong vibrations through your steering wheel or you have to constantly correct your steering to stay straight on the road you should make an appointment to stop by and have a Complimentary 4 Wheel Computerized Alignment Evaluation- with coupon and appointment. 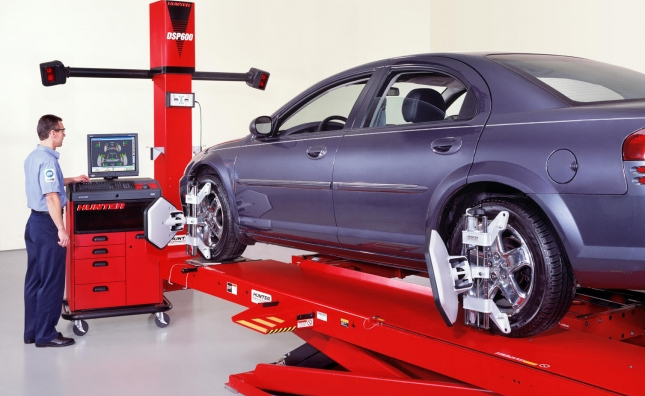 We have the most advance 4 wheel computerized alignment racks in the business that will produce a computerized print out showing you the condition of your vehicles alignment and whether and where there is a need for adjustment.